Wikipedia lists some one hundred people as important popularizers of science, most of them prominent scientists in their fields who interpreted successfully and remarkably their scientific knowledge to a language easily understood by a general audience. Especially those involved in TV shows and documentaries, such as Carl Sagan and David Attenborough, had the opportunity to make massive contributions to the dispersion of scientific knowledge, even to large portions of the public nursed exclusively by TV culture. Others, especially those of the early era of the popular science genre and those confined to book authoring, remain largely unknown despite their sometimes amazing quality of work. It is not uncommon in the history of Science some great people not to get the credit they deserve – and political or cultural barriers sometimes play some role in this. For example, most of us know about Wernher Von Braun but how many of us know about Sergey Korolyov? Those interested to popular science readings must certainly know Martin Gardner’s work but how many know anything about Yakov Perelman’s work? This essay is about this largely unknown Yakov Isidorovich Perelman (1882 – 1942) and the story that possibly links his work to the eventual solution of a notoriously difficult, hundred years old mathematical problem in 2003, the only Millenium problem to have been solved so far. By a remarkable coincidence the man who achieved this feat, Grigori (or Grisha) Perelman is the son of another Yakov Perelman, unrelated to Yakov Isidorovich. Yakov Isidorovich Perelman was actually a forester who exhibited a particular talent and creativity in presenting scientific ideas and problems in a very comprehensible, appealing and often humorous and entertaining manner. His first book “Physics for Entertainment” (“Zanimatelnaya Fizika”, 1913), a wonderful, amusing and instructive work, became a big success. In the foreword of the 13th (and last in his lifetime) edition in 1936, Perelman notes: “I have tried my best both to arouse interest and to amuse, as I believe that the greater the interest one shows, the closer the heed one pays and the easier it is to grasp the meaning – thus making for better knowledge”. It is exactly this kind of thinking that distinguishes Perelman from other authors of “puzzle” books. Perelman is not presenting just a collection of superficial puzzles but instead, to use his own words, he uses “conundrums, brain – teasers, entertaining anecdotes and stories, amusing experiments, paradoxes and unexpected comparisons” to serve a purpose, namely to help establish a deeper knowledge in Physics. He even makes a pioneering suggestion: “Believing sci-fi most appropriate in a book of this kind, I have quoted extensively from Jules Verne, H. G. Wells, Mark Twain and other writers, because, besides providing entertainment, the fantastic experiments these writers describe may well serve as instructive illustrations at Physics classes”. In “Physics for Entertainment” can also be found a quite interesting account of the futile efforts to build a pepretuum mobile (a perpetual motion machine). Perelman ridicules these efforts and repeatedly stresses the impossibility of such a contraption, based on the laws of Physics, using a language and style not very different than that used today by scientists and skeptics against pseudoscientific or charlatan claims. In this and in most aspects, Perelman’s work remains modern to this day and his books are still entertaining and instructive. 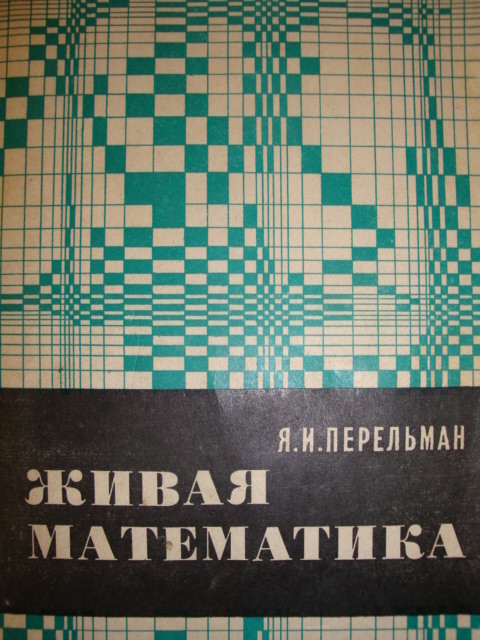 Following the “Physics for Entertainment” success, Perelman wrote many similar books on Arithmetic and Mathematics, Geometry, Physics and Astronomy that became successes throughout the Soviet Union, while he also authored several textbooks. Works of Perelman were also translated in 18 languages and his popular science books totaled 126 editions, however he never became widely known in the west. Even prominent and famous popular science or popular mathematics writers of the west, rarely include Perelman’s works in their references. Few years before Perelman’s first book was published, the great French mathematician Jules Henri Poincaré (1854 – 1912) put forward a mathematical question that became known as “the Poincaré conjecture” and was destined to haunt the mathematical community for almost a century. Putting aside the mathematical jargon, it is not too difficult to understand what the problem is about. Poincaré was one of the founders of topology, a branch of Mathematics that treats objects (or manifolds) as if made of modeling clay. Any deformation of an object is called a homeomorphism as long as the object is not torn, glued or punctured. Therefore, an object with only one hole (such as an ordinary teacup) is homeomorphic to any other object with only one hole (such as a doughnut) since the former can be continuously deformed in such a way as to produce the latter. From that point of view, a sphere is homeomorphic to a plate, a stick and a potato but is not homeomorphic to a needle. From the topological point of view, the sphere, the plate, the stick and the potato are all considered as the same thing and are called 2-spheres (i.e. two dimensional closed surfaces homeomorphic to a sphere). A loop on the surface of a 2-sphere can obviously shrink and be reduced to a point without slicing the sphere. The 2-sphere is therefore said to be “simply connected”. Being simply connected is an important topological property of 2-spheres: any closed, two dimensional object with that property is a 2-sphere. Obviously, doughnuts are not simply connected: a loop around and through the hole in the middle cannot shrink and be reduced to a point without slicing the doughnut. Mathematicians routinely speak for objects in higher dimensions, though they cannot be envisioned, and therefore the above question of simple connectivity may be considered for 3-spheres, 4-spheres and, generalizing, for n-spheres. It turned out that especially the question about 3-spheres was a very hard nut to crack. And this was exactly the question put forward by Henri Poincaré in 1904: provided that a three dimensional closed surface is simply connected, does this necessarily mean that the closed surface is a 3-sphere? To drop the question mark, the problem was to prove (or disprove) the proposition: every simply connected, three dimensional closed manifold is a 3-sphere. During the whole 20th century, prominent mathematicians made numerous unsuccessful attempts to answer the question and, as Poincaré himself predicted, this problem took the mathematical community too far. In the year 2000, the Clay Mathematics Institute included the so called “Poincaré conjecture” amongst 7 great problems of Mathematics, the so called “Millenium problems”, offering a prize of 1000000 U.S. dollars for the solution of each one of them. After 1980, Richard Hamilton of Columbia University, made considerable progress towards the proof of the Poincaré conjecture and was even able to prove it for some special cases. Hamilton’s ideas proved essential to the eventual solution of the problem. In 2002 and 2003, Grigori (Grisha) Yakovlevich Perelman of the Steklov Institute of Mathematics in St. Petersburg, Russia, posted three papers on the internet, completing Hamilton’s program and providing a sketch of the proof of the Poincaré conjecture, turning it thus into a theorem. Though it took for the mathematical community another couple of years to verify the proof and to ascribe credit to Perelman, it is now generally accepted that his work bore the stamp of an incredible, exceptional genius. It turned out that during the period from 1992 to 1995 and while he was in the United States, Perelman had met Hamilton several times. At a certain point, after Perelman’s return to Russia in 1995 (the Soviet Union had dissolved four years before) he had actually written to Hamilton, hoping to a collaboration on the Poincare conjecture but Hamilton never answered. Grigori Yakovlevich (son of Yakov) Perelman is a certainly remarkable character with a quite striking background: born in 1966 in Leningrad (now St. Petersburg), he attended a school specialized in Mathematics and Physics and as a member of the 1982 USSR team he became a gold medalist at the Mathematical Olympiad, achieving a perfect score. He did his Ph.D. at the Leningrad State University, a quite prestigious institution of the Soviet Union, and soon he established a reputation. After a two year fellowship at the University of California, Berkeley, he was offered positions at several top range universities, such as Princeton and Stanford. Curiously or not, he turned them all down and returned to Russia, at the Steklov Institute of Mathematics in St. Petersburg. This turned out to be the first in a long row of denials that may interpreted as results of peculiar idiosyncrasy, sensitivity, dedication or disillusionment. After 1995, Perelman worked virtually alone in St. Petersburg until the great breakthrough in 2002 and 2003 that made him famous beyond the narrow mathematical community. When in 2006 he was offered the highly prestigious Fields medal (a distinction probably even more prestigious than a Nobel prize), Perelman declined, despite the efforts of prominent mathematicians to convince him to be present at the award ceremony in Madrid, Spain, attended by three thousand exceptional mathematicians and the king of Spain Juan Carlos. Previously, he had declined an award by the European Mathematical Society. So far, he has even made no step whatsoever towards his obvious eligibility of the Clay Institute 1000000 dollars prize. Moreover, what is more strange, Perelman never took any step towards publishing his proof in any mathematical journal. Reportedly, since 2003 he has probably abandoned Mathematics, disillusioned by the ethical standards of the mathematical community. It is a fact that Perelman has at least once experienced attempts to downplay his role in the Poincare conjecture, based on the ground of supposed gaps and missing details in his proof. By general consensus, these gaps are of minor importance and cannot diminish Perelman’s accomplishment. 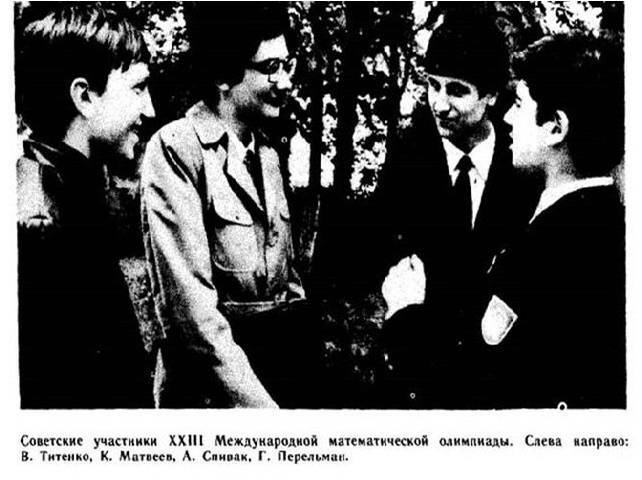 The Soviet team of the 23rd International Mathematical Olympiad. Grigori Perelman appears first from right. What connects the two otherwise unrelated Perelmans, Yakov Isidorovich and Grigori Yakovlevich, apart from their common last name, is the admission by Grigori Yakovlevich that Yakov Isidorovich’s work provided inspiration for him at an early age. Grigori’s father, by coincidence another Yakov Perelman, gave special attention in the mathematical interests of his son, providing him with books, problems and encouragement. “Physics for Entertainment” was one of these books that acquired a special value for Grigori not only because of the undisputable quality of its content but perhaps also for the obvious reason that it was written by a man who shared the same name as Grigori’s father. Yakov Isidorovich’s books were quite popular throughout the Soviet Union and remained so for decades. As he himself explains in the 1936 edition’s foreword of “Physics for Entertainment”, his book may have been read by millions of people, since many copies were distributed in Soviet public libraries and each copy may have reached tens of different pairs of eyes. It is more than certain that his work, with its appeal and originality, encouraged and inspired thousands of young girls and boys, during a long period of decades. It comes as no surprise that many of them were directed towards mathematical studies, partly because of exactly that inspiration, or that few of them may have excelled in mathematical research. And it is certainly not a surprise that someone among them, Grigori Yakovlevich, eventually made a historic contribution to Mathematics. Unfortunately, although Grigori’s fate is not sealed, both Perelmans’ lives had to take a sad turn in some way. As mentioned before, Grigori lives withdrawn in an apartment of Kupchino, St. Petersburg, apparently without employment, probably enjoying long walks and opera, two of his favorite activities, and perhaps having some new Mathematics buzzing in his head. Yakov Isidorovich Perelman died of starvation during the Leningrad siege by the Germans, in 1942. Apart from recognition, and after Grigori’s denial of awards and positions, the only honor done to him so far is the naming of asteroid “50033 Perelman” after him. Similarly, a rather humble, worn lunar crater, near the insignificant Lacus Solitudinis, the Lake of Solitude, bears the name of Yakov Isidorovich.